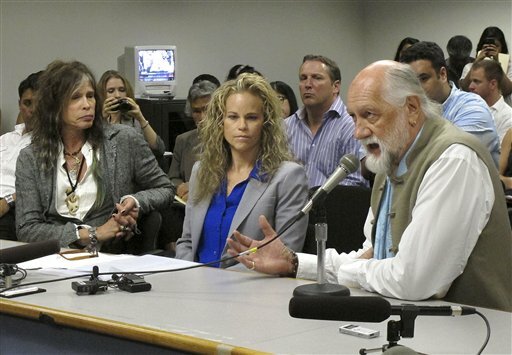 Steven Tyler, left, and Mick Fleetwood, right, testify about an anti-paparazzi bill. Tyler’s lawyer, Dina LaPolt, center, drafted the bill. The Hawaii anti-paparazzi bill pushed by rocker Steven Tyler has lost momentum in the state House of Representatives after flying through the Senate earlier this month. The bill seemed like a sure thing after 23 out of 25 state senators approved the legislation on March 5. Tyler — the frontman for the band Aerosmith — and Mick Fleetwood of Fleetwood Mac testified at the hearing and urged senators to pass the bill. Concerned First Amendment advocates — including the Reporters Committee for Freedom of the Press — sent a letter to the legislators arguing that the bill infringed upon the constitutional rights of photographers. Consumer Protection Committee Chairman Rep. Angus McKelvey said this week that he will not hold a hearing for the bill, which has already missed one internal House deadline. Tyler’s attorney Dina LaPolt said the law effectively died in the House because the media accounts of the bill concerned many of the House representatives. “I felt like the opposition to the bill was unjust because what many opponents were claiming was that it was violating the First Amendment, which it absolutely does not,” LaPolt said in an interview. McKelvey could not immediately be reached for comment regarding the sudden lack of support for the bill, which needs to be approved by the consumer protection, judiciary and finance committees before it goes any further in the state’s legislative process. The bill — dubbed the Steven Tyler Act — would allow people photographed while on their private property or during “personal family activities” to sue the photographer for invasion of privacy. Tyler expected his namesake bill to pass through the state legislature without any problems since the state Senate almost unanimously approved the measure. “Now at least Joe [Perry] and I can go to Maui and walk around naked in the back lawn and write some crazy songs,” Tyler recently told Billboard. Perry is lead guitarist for Aerosmith. If the chairs of the three committees don’t hold hearings on the bill, the House speaker could refer the bill to another committee. However, House Speaker Joseph Souki said he would not override the decision of the three committees, according to the news reports. But the First Amendment advocates, in their letter, criticized the bill for being too vague. The next internal deadline to hear the bill is Thursday, but the Consumer Protection Committee will not discuss the measure, McKelvey said. “There is a better chance of people flapping their arms and flying from Lanai to Maui,” he told the AP. LaPolt said the emphasis should be on the provisions of the bill, not its name.